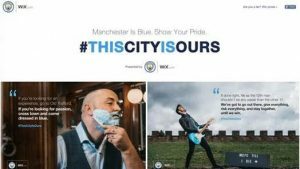 Manchester City have teamed up with web development platform Wix.com on a new campaign showcasing the "true" fans behind the club. As City’s official website design and hosting partner, Wix.com will kick off its first fan engagement activity for the season by unveiling fan-focused website “This City is Ours”. The site will showcase images of some of the "truest" Manchester City fans and the codes they live by, beginning with seven fans from in and around the Manchester area. Fans include seven-year-old Braydon Bent from Lynn, who keeps his father’s seat from the old stadium at Maine Road in his own bedroom. This City is Ours will also feature more fan profiles, competitions and unique content from the club throughout the coming season. Omar Berrada, City's chief operating officer, added: "We are incredibly proud of the fans we have at Manchester City. Their passion and support is invaluable to everyone at the Club and Wix’s This City is Ours is a unique opportunity to highlight their stories."